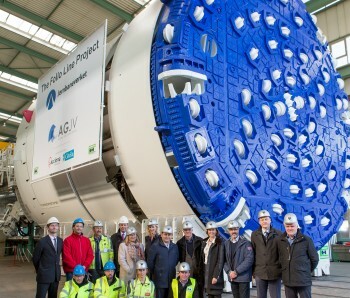 This TBM is customized for the Follo Line Project and was handed over from the producer Herrenknecht, Thursday 10th March. In September, it will start boring the TBM section of the tunnel, which eventually will be Scandinavia’s longest railway tunnel when it is completed in 2021. 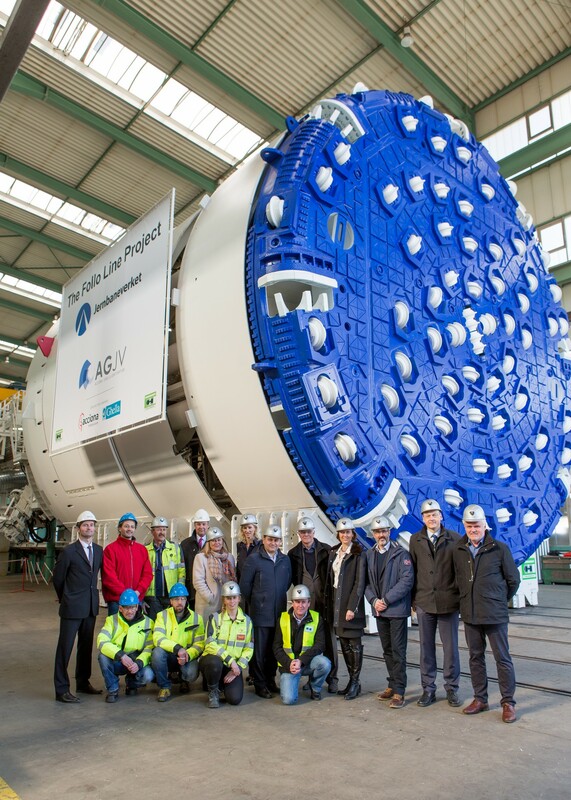 In addition, it will be the largest Norwegian TBM-project in history. 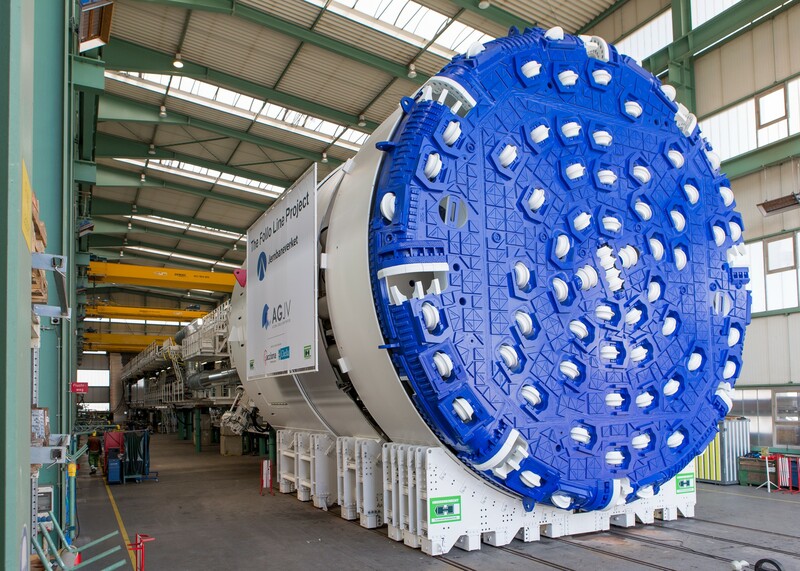 A tunnel boring machine (TBM) is a machine used to make a complete and watertight tunnel in one process. 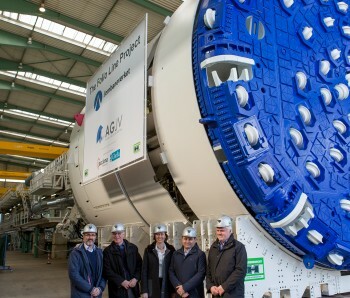 The construction company Acciona Ghella Joint Venture will use four similar TBMs to excavate 18.5 km of the 20 km tunnel between the Norwegian capital Oslo and the city of Ski, on behalf of the Norwegian National Railway Administration (Jernbaneverket). 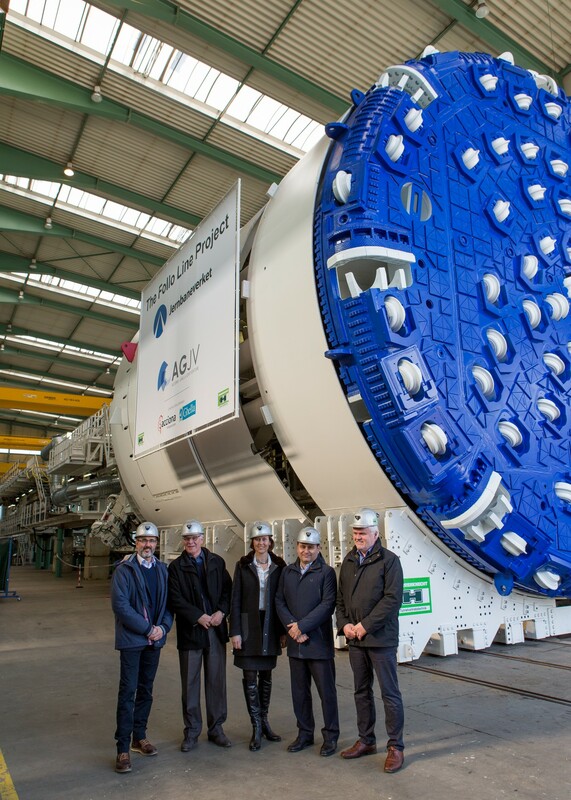 - We are proud to present the first Tunnel Boring Machine to be used at the project. 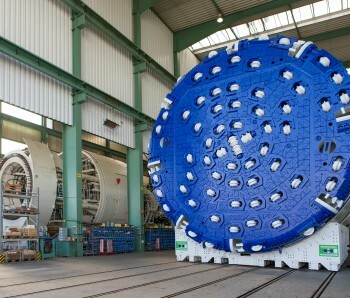 The cutterhead in front is in Oslo-blue colour, and these TBMs have been customized for Norwegian rock and geology. The collaboration between Herrenknecht, Jernbaneverket and AGJV and has been very good, which is reflected in a delivery ahead of schedule, with good quality, says Mr. Fernando Vara, Project Director in Acciona Ghella Joint Venture. 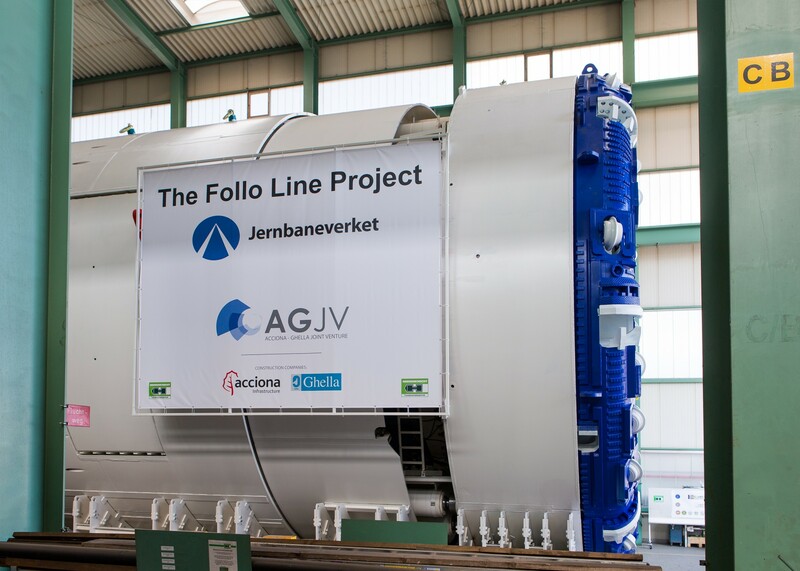 The joint venture between the Spanish company Acciona and Italian Ghella was awarded the 1 billion Euro contract by Jernbaneverket in the spring of 2015. - The excavation method for the main part of the long tunnel in the Follo Line Project was decided at the end of 2012, after careful consideration. 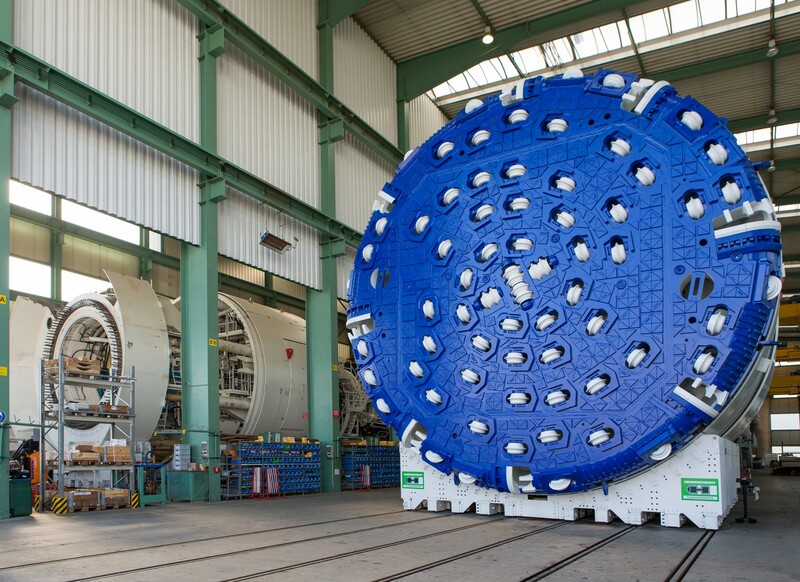 For this project in particular, TBM was considered the best solution due to the environment and the fact that we have access to one large rig area for the total TBM tunnel construction work. Today we have reached another milestone in this tunnel history. We are impressed by the TBM production. 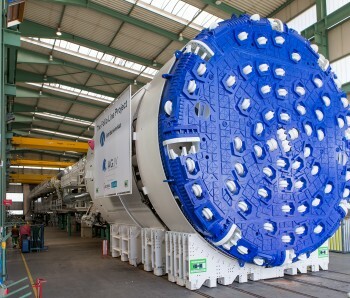 This first TBM is ready in less than one year since the contract was signed. We are looking forward to our further cooperation, says Mrs. Anne Kathrine Kalager, Project Manager TBM for the client Norwegian National Rail Administration (Jernbaneverket). The now completed TBM will arrive at the construction site in May in pieces and assembled again inside a underground cavern at the construction site. According to the plan, it should start boring towards Oslo in September 2016. TBMs excavate rock using cutter disks in the cutter head at the front of the machine. Inside the TBM, there are a number of installations, including a conveyor for transport of rocks and the lining of concrete segments. - We are proud to be part of this milestone-project. With our high-tech tunnel boring machines and our service reliability, we will contribute everything possible to ensuring Norway gets the longest railway tunnel in Scandinavia to the highest global standards, says Dr.-Ing. E. h. Martin Herrenknecht. The twin railway tunnels made by the TBMs will be 8.75 metres in internal diameter, and about 18.5 km long. In total, the tunnel will have a length of 20 km. The four TBMs will all have a length of about 150 m and weigh about 2400 tons. 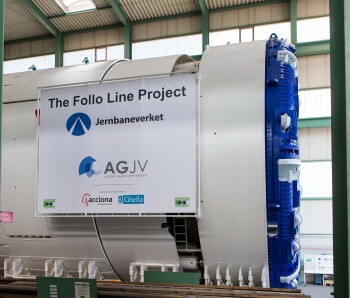 In total four TBMs will be used at the Follo Line Project. They will be delivered throughout the year and are planned operational within 2016. Two of the TBMs will drill north towards Oslo and two will drill south toward Ski, starting from the construction site at Åsland. - We have completed the first phase of excavating tunnels at Åsland ahead of schedule. Now we are preparing for a new and exciting phase, the construction of the tunnel with TBMs, says Mr. Fernando Vara, Project Director at AGJV.